Eating disorders are multi-dimensional disorders that require integrative and highly specialized treatment. Because eating disorder pathology impairs every aspect of the patient’s physiology and emotional development …including brain chemistry and function, cognition and concentration, nutrition, mood, behavior, interpersonal relationships, and the capacity for problem-solving and self-regulation…a complete healing needs to be a comprehensive healing, addressing and repairing all of these processes. In seeking treatment for a child with anorexia, bulimia, binge eating disorder, or EDNOS, (eating disorder not other specified) a parent’s first responsibility is to recognize and respond to this crisis that has befallen child and family, finding resolution in specialized professional care. Generic psychotherapy overlooks the immediacy of the need to extinguish potentially lethal behaviors that underlie and perpetuate these disorders; strictly prescribed behavioral treatments overlook the pivotal underlying emotional issues driving these disorders, often ignoring the power of the quality therapeutic relationship to motivate healing. 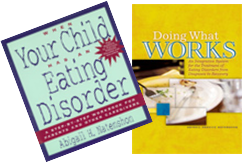 Eating disorders are never stagnant; they are either getting better or they are becoming more deeply entrenched. Response requires taking action, without delay. Despite this, parents are typically warned to "steer clear” of their child's eating disorder, food intake, treatment and recovery, for fear of making matters worse; “It's her treatment, not yours.” One therapist advised a mother to “back off” when her son became a binge eater to demonstrate her faith in his ability to be in control of himself, to let him know that “what he does, he does for himself, and not for me.” What she failed to understand is that informed parental involvement is not synonymous with interference, and that in the face of an eating disorder, the child’s malnourished brain and disregulated personality is not emotionally or cognitively prepared to assume self-control. The appropriate degree of parental involvement will be dependent upon the child’s physical condition, age, life stage and developmental status, motivation to heal, recovery status, quality of parent/child relationship, a parent’s emotional and geographic availability, and the therapist’s willingness to be inclusive. Paralleling the ever-changing needs of the afflicted child, the nature of parental support will change throughout the healing process, diminishing with the child’s increasing capacity for self-care. 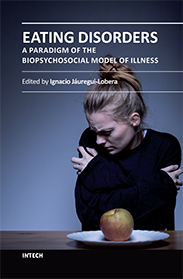 It is only after a disordered brain becomes sufficiently re-fed and a healthy relationship with food is re-established that the patient becomes free to engage optimally in treatment, setting the stage for parents to step back safely, gradually and with sensitivity. Where parents prematurely opt to assume a hands-off policy, the child is more apt to lack the wisdom, incentive, support and skills required to heal, and to choose not to recover at all. The path to recovery is never clearly defined. Beware the inevitable pitfalls that line that path. · Shrouded in misconceptions, eating disorders are difficult to comprehend; it is not uncommon for patients, parents, and even some health professionals to believe that eating disorders are incurable, that parents are the cause of their child’s disorder, or that disordered behaviors will respond to will power alone. In fact, eating disorders are completely curable in 80% of cases where treatment is timely and effective. · Beware of the widely held belief that weight restoration alone, (though essential to physical and mental health) is the definitive standard for measuring eating disorder recovery. Healing is a learned process that occurs through self-awareness and self-discovery, the result of the patient’s efforts to restore or regulate weight in accordance with the body’s self-determined set point. The acknowledgement and growing trust in one’s own internal resources and emotional resiliency marks the return of the previously exiled Self. The learned emotional versatility and effective coping mechanisms that signal eating disorder recovery applies to all life spheres. · Eating disorder recovery essentially occurs throughout the course of daily living and within the context of the family system, 24/7, at home, in kitchens and bathrooms, at restaurants and gymnasiums. As models of healthy values, problem solving and lifestyle, it is a parent’s responsibility to guide and mentor their child’s emotional and developmental tasks throughout the life stages… tasks that essentially define eating disorder recovery. It is the responsibility of therapists to involve and inform parents. Therapists have limited and temporary access to the recovering child; parents never stop being parents. · Challenges for parents appear at every stage of a child’s disease and recovery. As the suffering child becomes increasingly withdrawn, secretive and irritable, parents tend to lose confidence in their capacity to know what to do, and to say, in response to the child who increasingly becomes a stranger to them. The process of recovering feels worse (more anxiety provoking) to the child than does the disease; positive recovery changes are often not discernable in a child’s behaviors, and are often camouflaged in what appears to be ‘failed attempts’ at recovery tasks; a recovery that is not complete is a partial, or managed recovery, that can be anticipated to end in relapse. A parent’s understanding and communication about the counterintuitive nature of recovery is the best antidote to countering a child’s recovery resistance, unrealistic expectations, and/or hopelessness. · Despite reaching the age of consent and one’s right to privacy offered through HIPPA laws, afflicted teens, young adults and grown children living away from home also benefit from a parent’s clear voice of concern and guidance. In some instances, parents may be able to provide incentives to heal, or may assist by advocating with insurance companies for treatment coverage, or by researching hospital programs and other community resources. A passive response to an active disease can only enable pathology. As consumers of possibly the most important function in their child’s life, parents need to evaluate professional caregivers carefully before choosing the best one for their child and family. The initial phone conversation offers a great deal of information to those parents who are savvy enough to use that vehicle productively. It is critical to assess a candidate’s knowledge of eating disorders, treatment- and relationship- style, and willingness to embrace parental input through family therapy. If at any point the treatment relationship ceases to evoke trust in the therapist, the healing process, and in ongoing positive change, it may be time to look elsewhere for more effective treatment. No one knows a child and his needs throughout this process better than does a parent. During initial contacts, the therapist needs to generously offer information and education to patients and parents alike, explaining what eating disorders are about, their origins in biology, and their implications for the child; their unique treatment requirements and optimistic expectations for recovery; and the importance of an ever-changing, supportive role of parents within the recovery process. Eclectic in skills and methodologies, versatile in the use of self within the therapeutic relationship, and skilled in cognitive-behavioral protocols, therapists model and fortify the role of parents in their child’s healing; through conjoint family treatment and professional coaching, they provide answers to questions asked, as well as to those not yet formulated. The eating disorder practitioner fosters the recovery process through a behaviorally based, change-centered, outcome-driven ongoing treatment plan, motivating and inspiring the healing process through the quality of the therapeutic connection with both child and family. The mark of a successful treatment process is ongoing positive change… in eating and in behavior, in cognition and in emotions, in judgment and relationships, in problem solving and self-awareness, in self-regulation and self-esteem. Indicators of various types of change should be sought within the fabric of each and every treatment session. Therapists need to be directive, intentional, and vigilant of the patient’s ever-changing level of physiological risk, offering options for the use of psychopharmacological medication and/or alternatives for more restrictive treatment venues for those patients who are unable to continue to make, or sustain, positive changes throughout the full course of treatment. It is critical that parents hold the professional team responsible for facilitating continuing change and improvement in their child to the point of a complete and sustainable recovery. As active members of the treatment team, parents enhance the recovery process by offering pivotal input, support and feedback at critical junctures during treatment, particularly at times of recovery stagnation and regression. There is no better support for treatment or therapist than what an informed and motivated parent can provide.